Film Score Monthly is one of the leading voices in film music appreciation. FSM was founded as a one-page newsletter sent to 11 people by editor/publisher Lukas Kendall in 1990, and has since grown to encompass a hardcopy magazine, prolific CD label, this website, and other publishing and documentary efforts. It is hard to believe that in 1990, "soundtracks" to the general public meant only popular song compilations such as Top Gun and Footloose. Today, thanks in part to efforts like FSM, there exists a broader understanding and appreciation of the original dramatic underscoring composed for motion pictures, television, and new media such as videogames -- and of the talented composers who create it. The hardcopy magazine Film Score Monthly emerged out of the 1990 newsletter and published over 150 issues until ceasing for budgetary reasons at the end of 2005. The magazine lives on today as "FSM Online," the pay portion of this website, which continues to provide new interviews with prominent composers, insightful film score reviews, commentary, retrospectives and more. Between the new FSM Online content, and the archived print articles, FSM offers an historical invaluable body of work about this neglected art form. 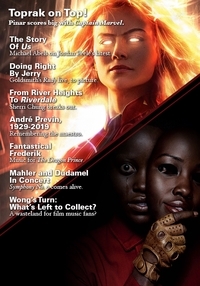 FilmScoreMonthly.com also features free content, primarily "Film Score Daily," a news and information column which was founded at the time of the website in May 1997. The record label Film Score Monthly was founded in 1998 and has released over 200 CDs of historically important original soundtracks from the 1940s through the 1980s. These film scores—typically unavailable anywhere else—are licensed from the Hollywood studios and lovingly preserved and restored for commercial presentation. Many are "Holy Grails" long desired by film music aficionados. The FSM CDs are available through this website via our retail partner, Screen Archives Entertainment. Thank you for visiting our website and by all means send us your comments or questions. Send to Lukas [at] filmscoremonthly [dot] com (pardon this low-tech method of avoiding spam! ).